This is a set of cards I made for a friend I met for lunch before the holidays. I found the warm earthy tones of the BoBunny paper very soothing. The set contained four different styles of cards. 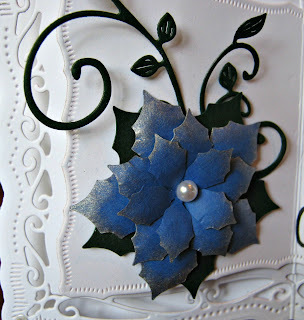 On this one I made the flowers used to embellish it and a stamp by Impression Obsession. 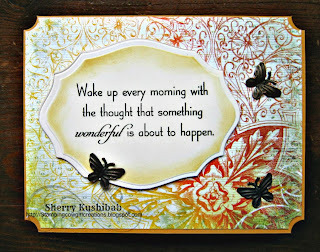 The paper and sentiment from My Favorite Things on this card just screamed butterflies.......these are metal and add a nice touch. My friend likes chickens and roosters and swore she wouldn't send this one out as she wanted to hang it in her kitchen....I told her I can always make another one. Colored this fella with some copic markers and used an embossing folder that looks like chicken wire for the background. 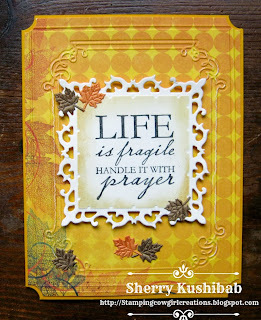 This sentiment is a favorite Spellbinder die and the leaves are from some ribbon in my closet. 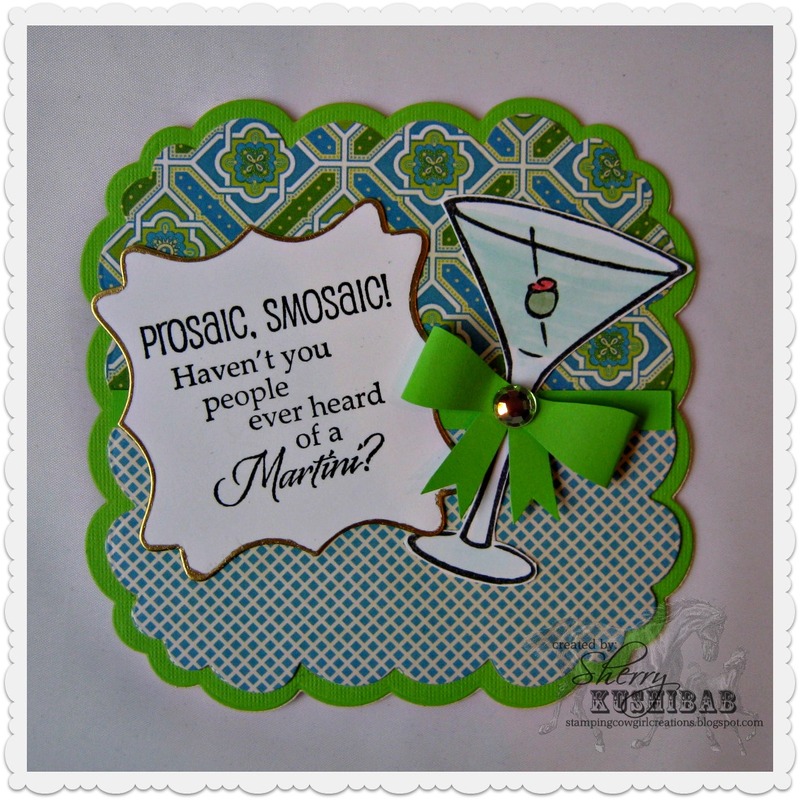 The sentiment is a stamp from Stampabilities. 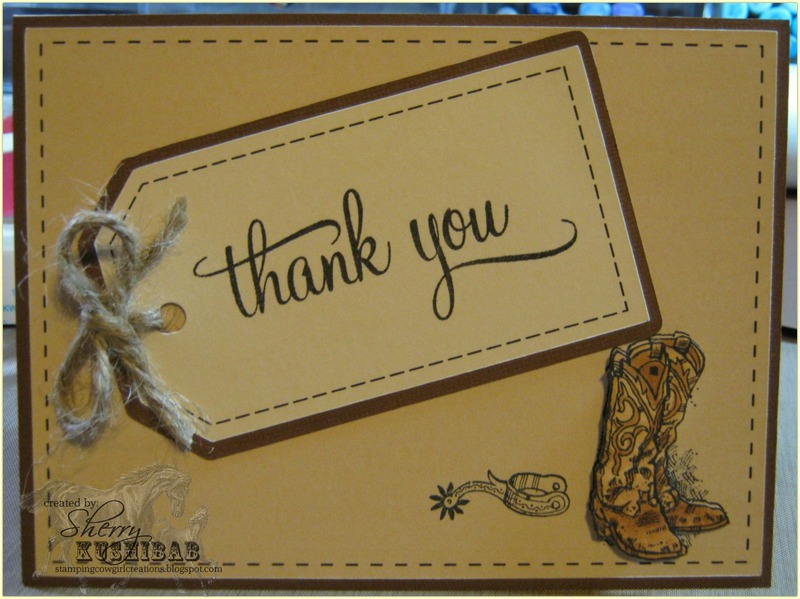 We had a great lunch together the day I gave her these cards - we even took some time to stop by one of my favorite stamp shops while we on that end of town. Personally crafting of any kind is fun to me. I especially enjoy making gifts for friends and family. While shopping at The Daisy Festival at Stone Mountain a few months back I purchased some fabulous handmade soap. What attracted me to this particular booth was the genttlemen had teak wood soap holders available for sale with his soap. Hand made bars of soap are great but they can get all 'icky - sticky' looking when they are wet and sitting with no air around them. I was fascinated by the way he had cut slits on each side that allowed air to circulate around the bar after you used it. As I thought about buying these I remembered an inspiration I had pinned from Pinterest for a spa in a jar. The little grey cells began working and I bought a bunch of soap and holders. Then the fun began.....My thinking was that I would simply buy a mason jar and add some goodies and have my 'Spa in a jar'. Oh, if it had only been that simple. The soap tied so sweetly to the holder was 3 inches across - no matter what I did it wasn't going to fit in a mason jar, and if I did get it in (sideways) the other items were going to be pretty cramped. 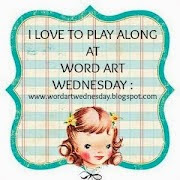 Not one to be easily defeated the hunt began for a jar that would work......I scrolled places on-line, I looked all over Michael's, Hobby Lobby and JoAnns - and as I hunted I began to get the sinking feeling nothing was going to work the way I had intended it to. As I prepared to give up on my idea I wandered down the isle of my local Publix grocery - lo' an behold on the bottom shelf I spotted various size Anchor Hocking plastic jars. Much better than glass ones that were heavy and hard to ship and if my eyes were not deceiving me they were the right size. I grabbed two sizes and put them in the cart - could these possibly work? To my great surprise they did!!!! The tallest was the perfect size to not only hold the soap and holder, but the rather large file I had purchased as well. Then the real fun began as I shopped around for more items to fit in my jar. My original idea had been to wrap a band of white card stock around the jar with my design but once again my handy dandy Silhouette Cameo came to the rescue. While shopping I discovered some new clear printable sticker paper by Silhouette and scooped it up to use. 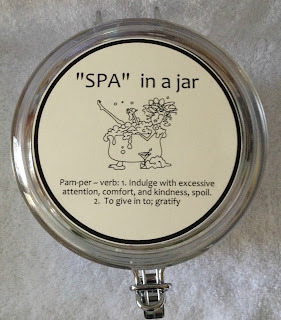 I made some long thick lines, typed out my heading 'SPA' in a jar, added a Bugaboo Digi of Stella in the tub, then I finished the label off with a definition for pamper. After printing this from my Silhouette I then cut several out and labeled my jars. 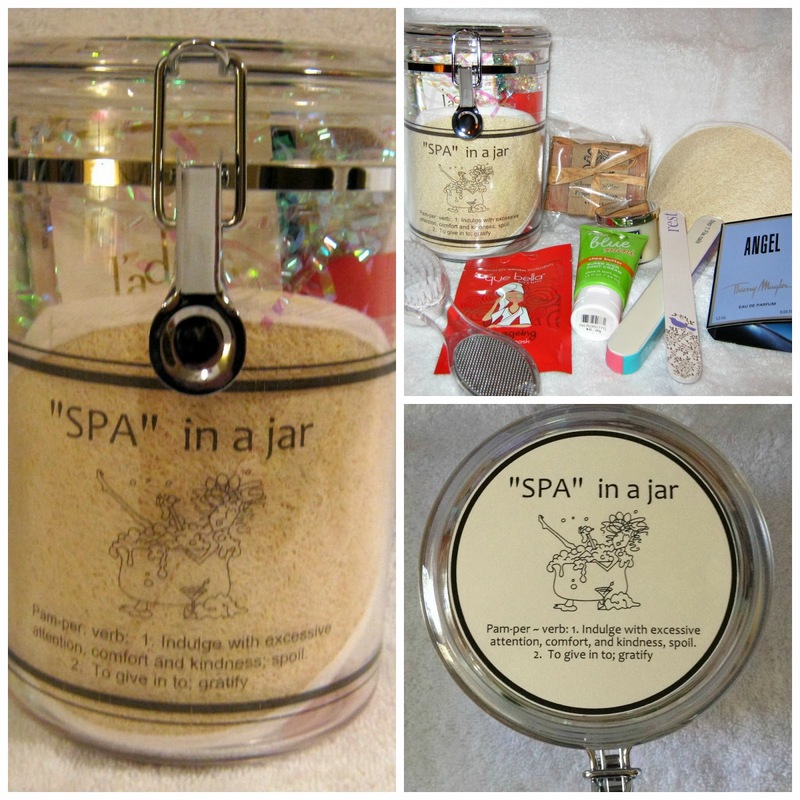 Having also bought a shorter jar I used some other holiday soaps I had on hand and created some smaller 'spa' jars as well. Once again I designed and printed my topper on my Silhouette, printed it then had my Silhouette cut it out. 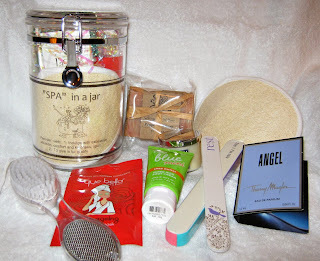 It was great fun putting these goodies together - for my sisters I scored a few samples of some colognes I knew they liked and added them as well as some soft socks, and other beauty items not in the picture above. I think my younger sister has already tried some of her new products to pamper herself. 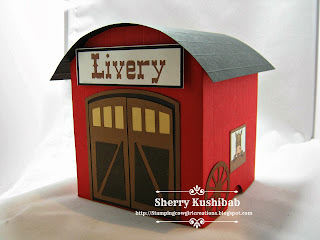 I am going to post this at the Silhouette Cameo challenge site for their December challenge of 3-d and anything but a card.....consider joining in on the fun with a project of your own. My daughter and I made our yearly trek to the White Stallion Ranch to do some horseback riding. There are about 18 of us who meet there each December from all over the US and world (England, Germany, Channel Islands, Minnesota, California, New Jersey, D.C. Tennessee - we adopted a visiting Australian this year as well). Every year we celebrate the birthday of a lovely lady named TJ. This year we knew we would be celebrating number 75 with her. Such a birthday called for a special card. Months ago I began dreaming the idea up in my head for an explosion box card AND FINALLY just before Thanksgiving I had time to sit and play. 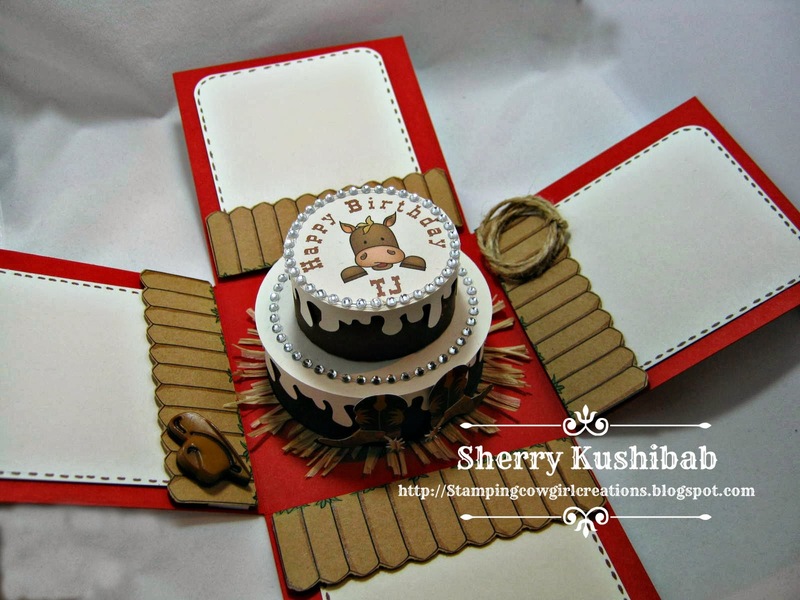 With the help of my Silhouette Cameo I was able to design a cake (my own design) and a barn style cover for the box (again my own design). The barn door is a cut file designed by Cali Arroyo, and the cactus and wheel are a cut file design by Jamie Cripps. The sweet horse on top of the cake and peeking out the window is a digital stamp from Clear Dollar Stamps. After designing this cake and frosting on my Silhouette Cameo.... I decorated it with a personalized message for TJ!! 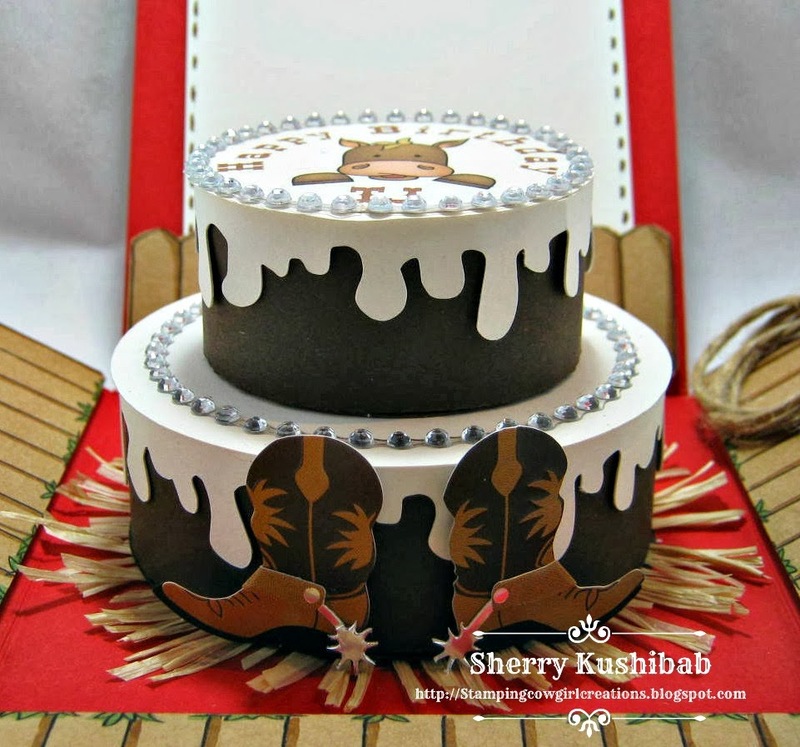 Every cowgirl needs some 'bling' and TJ's is on her cake - since the whole theme was barn oriented I placed the cake on some hay! I couldn't carry the card around the ranch and get signatures on the sly (given its size) so I created individual cards that I could slide out of the fences and carry around with a pen in a zip lock bag. This allowed me to get lots of good wishes for her on both sides of the inserts. Below is TJ getting ready to open her explosion box card - she was so excited by all the people who left her messages and Birthday wishes and she is ALWAYS so complimentary about the cards I make her....this one was a huge surprise to her. It was great fun making a card like this for such a special lady.....BTW she is wearing antlers because I couldn't find a tiara at the grocery store in Marana and holiday antlers were as close as I could come. She is a great sport. 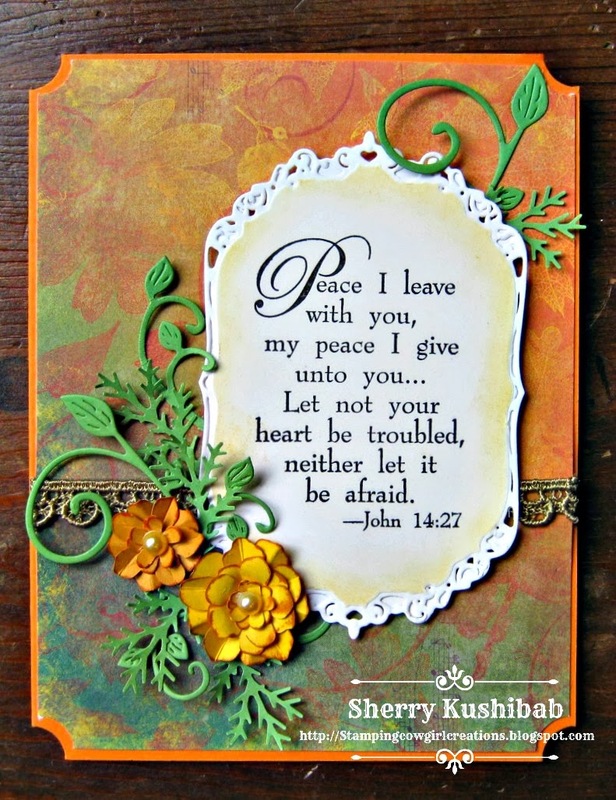 Going to post this on the Silhouette challenge this month for 3-D -- I love making 3-D cards and using my Silhouette has made them even more fun. 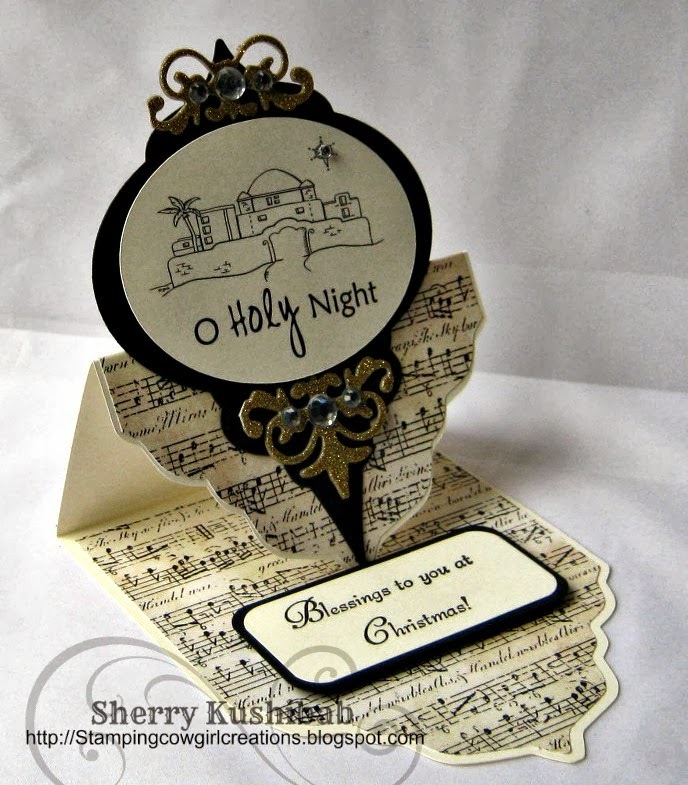 I am posting this over at the Silhouette Challenge for 3-d and anything but a card for December - think about joining in on the fun. If you know me at all you will find it no surprise to see this stamp inked up and colored. Why it took me so long to get it is beyond me.....guess that thing called life got in my way for a few weeks. However, from the moment I first saw it on on the blog of some of the Flourishes Design Team members I knew it would find a home with me. YES, I love it because it has a cowboy on it, but I also love it because it evokes a warm fuzzy feeling when you view it, whether it is colored or kept color free. Can't you just imagine the anticipation of this country family waiting for the 'perfect newly cut tree' to be pulled to the front door. The ornaments are out, popcorn has been strung......little hands are ready to decorate the tree. I bet there is a warm fire glowing in the hearth as well. A warm homey Christmas scene. I want to just take a moment to thank the illustrator Lauren Pope for creating this lovely design and Flourishes for making it into a stamp. After stamping this lovely image I used my Prisma color pencils - I heard that gasp just now, shock over my not using my oh so favorite Copic markers. I just felt the pencils would work better....I want to ink this up again and use my water colors. 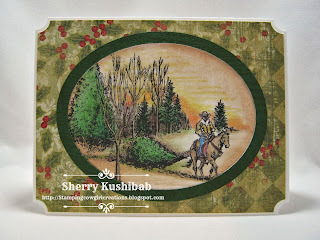 Using my Silhouette Cameo I cut an oval the size I needed in some designer paper and placed it over my image. To give it a little more pop I cut another oval out of some green card stock that I stamped over with a wood grain stamp - hard to see in this photo but it helped keep the green card stock from having that plain jane look, wood also seemed the right effect. 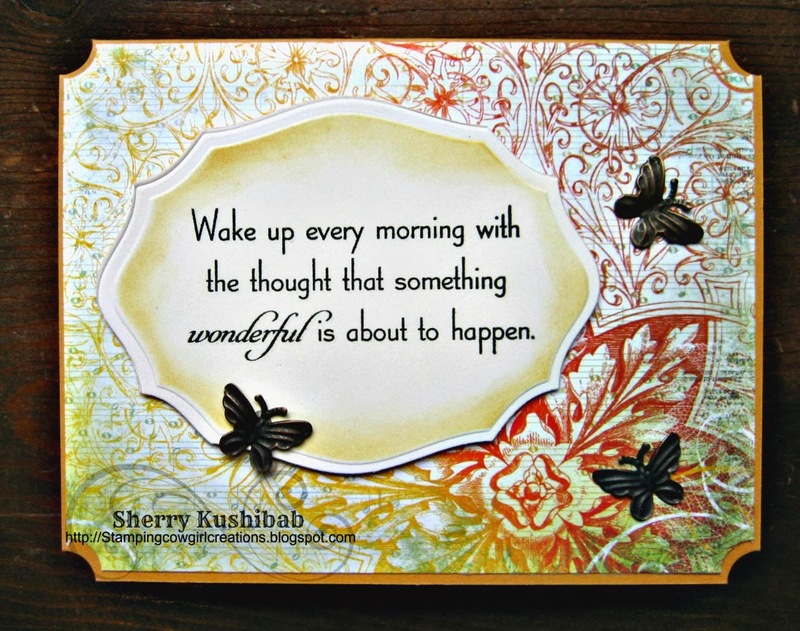 The inside was kept fairly simple with one of the many sentiments included in the set. Yes, it is beginning to look a lot like Christmas around here.........Thanks for stopping by. 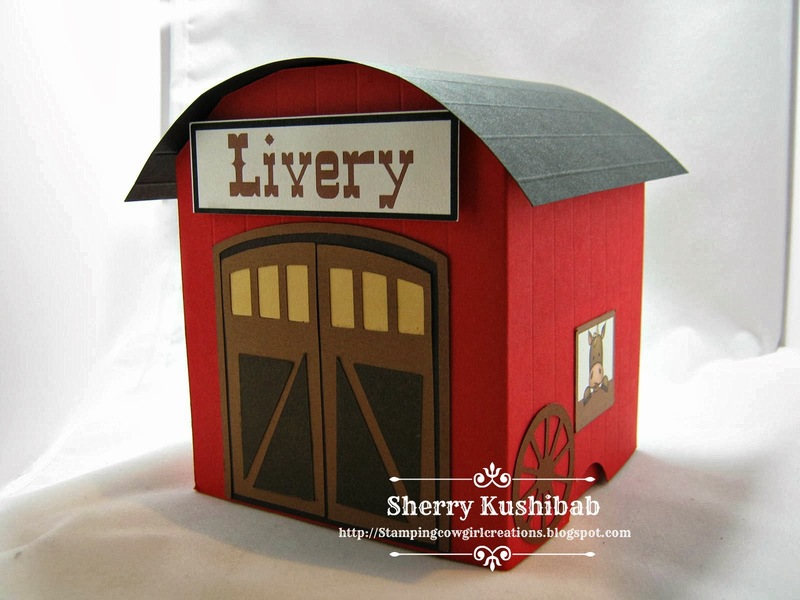 Visit my blog often enough and you will begin to see that I love Step Cards and 3-D projects. 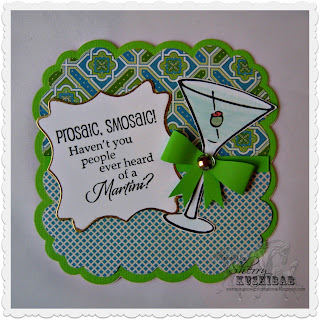 While perusing Pinterest recently I came across a card with this new shape I hadn't seen. Her picture tutorial was nice, but it seemed to me a lot of paper was wasted in her layout.....so, I went to my handy dandy Silhouette Cameo and drew out a background to use. This machine comes in soooo handy. I not only now have this style of card ready to cut when I want -- I can also cut out my layered pieces to the correct proportions as well. Often using scraps and laying them out for one run through. Now that's efficiency. 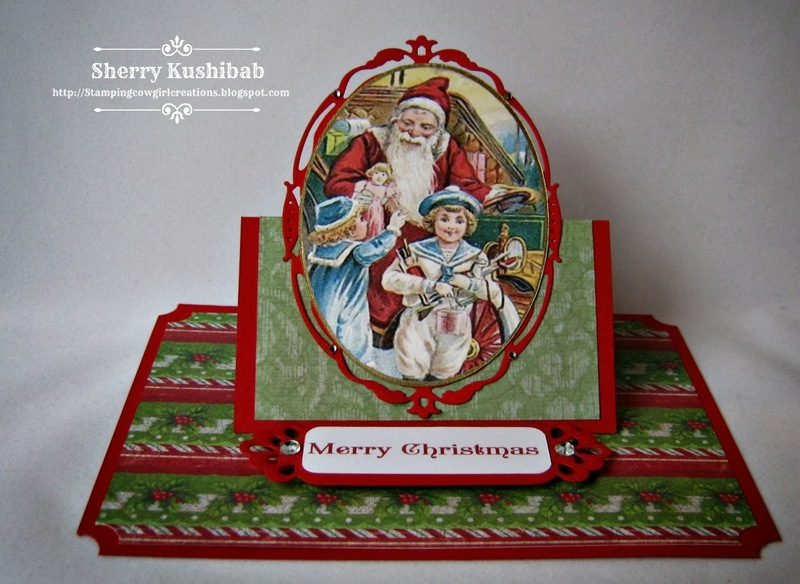 Vintage cards are usually not my style - but around Christmas time these images always appeal to me. I have several post cards that were my Grandmothers, as well as some other images, that date back to around 1903 - 1912. I have made cards and ornaments from copies of several of them over the years. 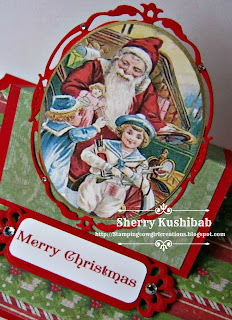 This paper by K & C from last years holiday stash seemed perfect for this image. The card when flat fits in an A6 envelope. After making this one I decided to start another one - the next is going to have lots of glitter to make it a little more vintage looking - I'm thinking it will be very nice looking. If I have a chance I'll try and post it. Months ago I saw a card on Pinterest that fascinated and inspired me. I had only recently purchased the Spellbinders Ornament die, but realized the shape of the card was nothing close to what I owned. So the picture was filed away until recently when I decided I would just have to make my own background to replace die used in my inspiration piece. Why own a Silhouette Cameo if you can't get creative. 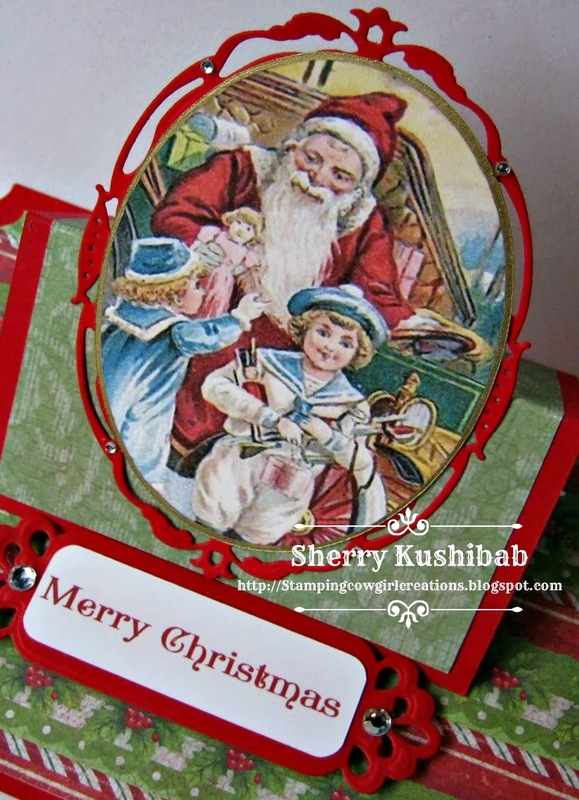 I designed my own shape for the easel background and then started playing.....I am in love with this sweet half moon Santa from Sassy Cheryl and I thought he would look great. However, he just looked SO plain sitting on the ornament - next thing you know I drew upon my inner Kiitie Caracciola (oooh I love her work - you can check out her gallery here) and out came the Martha Stewart punch, some snowflake dies, blinginty bling and soon Santa was nestled amongst the greenery with snowflakes falling. I do have to admit that at one point I had to tell myself 'step away from the bling' as I was afraid I might be getting to carried away. Below I have posted the inspiration image and a second card I made using this same easel background I created and the Spellbinders Ornament die.....it amazes me how changing things like paper, and images can make three very similar cards look so different. This is the inspiration piece, now watermark can't remember who did it, but they are talented. This is my second card using the shapes from my first one at the top of the page. 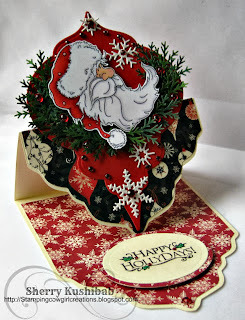 Just love how both of my cards turned out - beginning to look a lot like Christmas around here. I have about 13 ornaments painted and finished and ready to go. Thanks for looking. This card is for a Bella, she has been diagnosed with Acute Lymphoblastic Leukemia (only a few short months after her cousin Bridger received a more severe and aggressive cancer diagnosis). 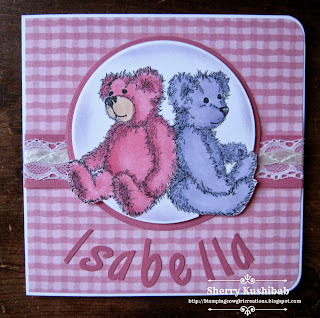 The Teapotters over at Splitcoast have challenged us to make Isabella some cards to cheer her up. I am late getting to the Tea Party.....which is rather ironic as I knew of Isabella's diagnosis and need for cards two weeks ago and made this card. I'm just way behind in getting it to the post office. The Teapotters will probably be making princess cards, I made this before the challenge, but I personalized it so Isabella would feel special. You can read about Isabella here. This card will get to the post office in the next two days and I am continuing to keep Isabella, her family and her cousin Bridger in my prayers......these kids are too young to have to go through all these treatments, breaks my heart. What troopers they are. While I enjoy creating cards I always find it a challenge to be asked for a Sympathy card....you want the card to reach out and touch the recipient, yet words are so difficult in those times. My co-worker needed a card for her Aunt who lost an older daughter pretty suddenly. As I surfed the net I came across a blog that had a poem that brought me to tears. The woman posting it had lost a child and put this poem, she had received, on her blog because she was so touched by it. There was no credit for who wrote it (I may have to Google further to find out and I will update that info if I find it). It was such a long poem I struggled with putting it on the inside of the card. Should it be on vellum as an overlay on some lovely paper with hearts in the background, should it be shrunk down and made so small it couldn't be read? Finally, I decided it should be the background of the front of the card. I printed it in grey ink and adjusted them so that the words went around the die I wanted to put in the middle -- two hearts, the poem ends with a reference to the heart. 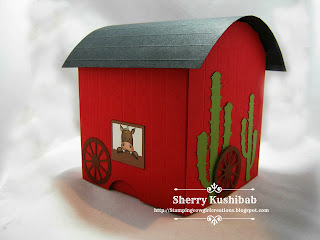 A friend at Splitcoaststampers challenged a few of us to some Jammer Town fun this weekend using a 'Western Theme'. I can't resist a western challenge so I put aside the pieces I have been designing on my Silhouette and took a break to make this card. 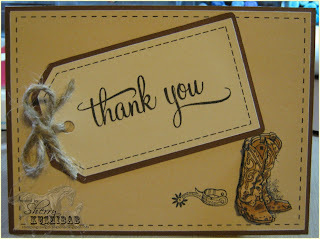 I got out my Little Buckaroo stamp from Sutter and a lovely background stamp by CC Rubber Stamps. 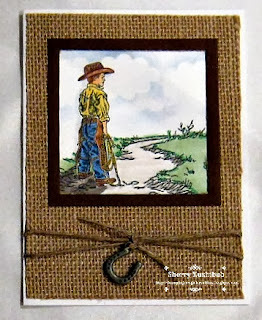 After stamping my buckaroo I masked him with to stamp over the image with the background stamp so he would look like he is standing in the field. Colored him with my Copics and dug out some recently purchased 6x6 burlap that is paper backed. Ran it through my Grand Calibur with a Spellbinders square die and then created a frame using to of the dies. A simple but fun card. I have been working hard designing my own cut files with my Silhouette and it was great fun to take a little time to make a card. Thanks Greenie (aka Sue). 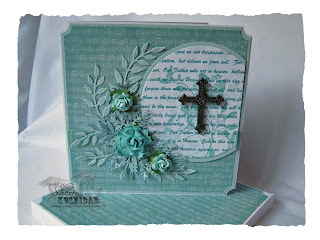 This may not look like much but I am proud to say with the exception of the Cheery Lynn Die I used for the greenery the rest was TOTALLY designed by 'moi' on my Silhouette Cameo - Yep - you read that right. 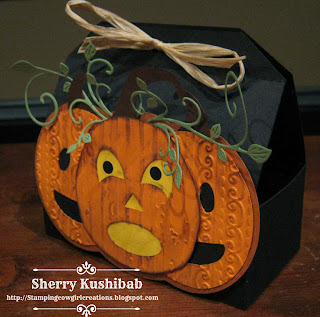 I did not buy a cut file to do this -----nope------I drew each line, circle and oval shape (over and over in several cases) on my own, from the box to the pumpkins. I doubt Silhouette is going to ask me to become a designer for them, but I sure did learn a lot doing this. There are some great designs available out there, but sometimes there is just a shape that you want and you don't want all the incidentals that come with it - and - if I wanted to sell anything from a cut file I have purchased, because it is for commercial use I would have to pay extra for the commercial right to do so. I respect the right of those who have designed the files I have purchased.....trust me I didn't whip this out in a few minutes, it was a labor of love getting this all laid out and measured correctly to cut the right way. It needs some tweaking but I sure am pleased by my efforts. Thanks for stopping by - if you have any questions please e-mail me.....in the meantime if you have a Silhouette play with it and have fun. Oh yes, it was a busy Monday in my little stamp castle......one might be a little confused looking around wondering whether it is Halloween or Christmas, but the stamps and paper were flying. This little treasure was made using the Spellbinders Radiant Rectangles die . 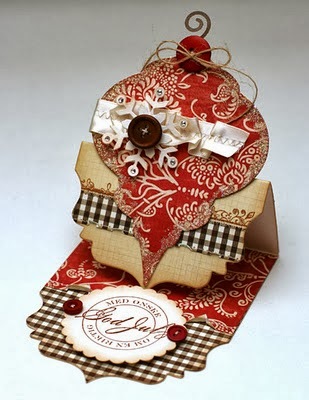 I love creating cards that are in an unusual shape, I especially like creating cards that just don't look like cards! 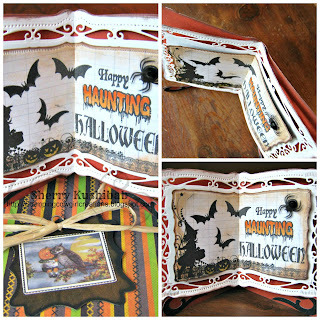 This one comes with its own easel stand (that I designed on my Silhouette Cameo). 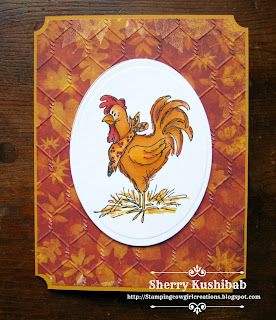 I was tickled recently when I read a post from another stamper who said she sends an easel with all of her cards as she considers each to be a work of art. The idea was conceived from a card I Pinned by 01Tink - while I LOVED her idea as a Sympathy card, I knew it would work for some holidays as well. The idea became a reality after a recent trip to my fave stamp store Impressive Ideas, in Roswell, GA - it is where I purchased the Authentique paper that I used in this and another project I'll post below. This won't quite fit in a conventional envelope so I made a box to send it in. I rolled the sides of each page on the rounded edge of my counter top and used some Collal glue (a silicone based glue, also purchased at Impressive Ideas) to keep the pages opened. My next project was made with purchases from Impressive Ideas as well, and inspired by the coffin they had created and had on display. I purchased the wood coffin that measures approximately 6 x 3 inches. I painted them black and then (with the use of my Silhouette) cut various papers from Graphics 45 and Authentique to decorate them. I can't tell you the fun I had at Michael's picking up some goodies like the spiders for the inside. This is the outside back of one, and front of another. Honest to goodness they are soooo cute and were such fun to make. I cut out some of the cute little witches, the moon and the clock from the Graphics 45 paper (I think some of this has been discontinued). The bat background is from the Authentique pad I purchased. 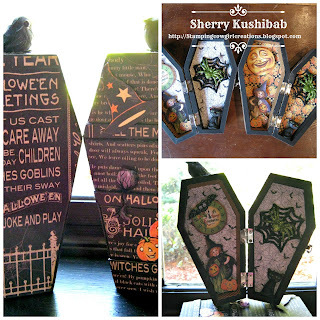 The sides of the coffins are covered as well - just a blast to put together, can't wait to put them in the mail. Thanks for stopping by and Happy Haunting!! Once again I will say I just love my Silhouette Cameo. 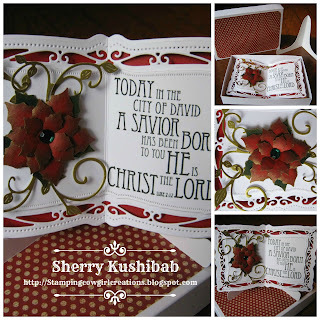 This sweet and lovely poinsettia was cut on it from a Lori Whitlock cut file. It is framed beautifully with a little extra greenery from my Cheery Lynn die as well. If you saw my previous post you may have read that it was a busy day in my Stamp castle recently. I can be forgiven for thinking it is Christmas since I work in the retail world and as we ramp up for the holiday it sometimes feels like its already here. 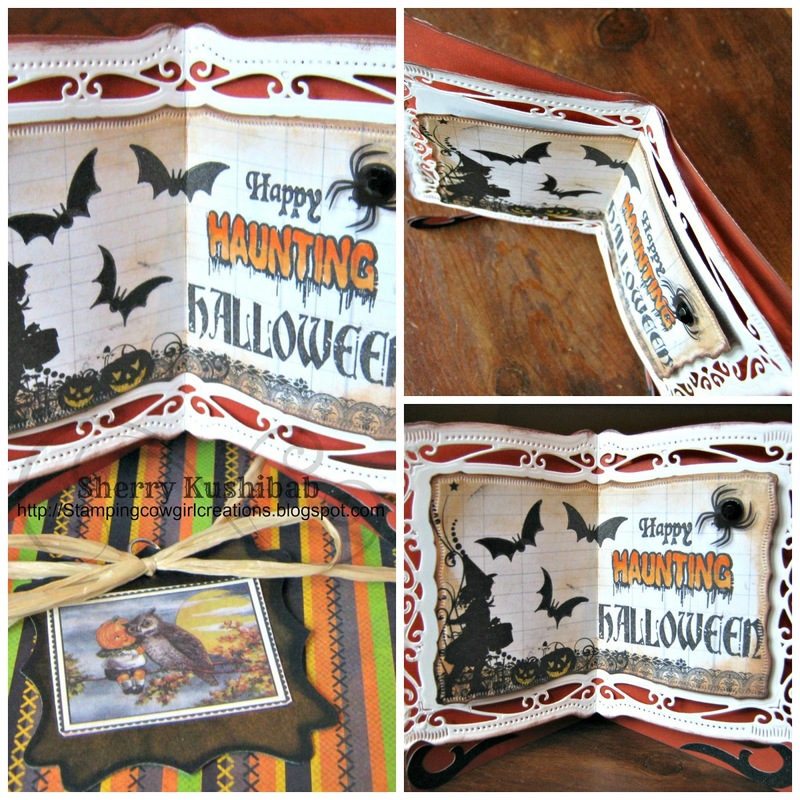 I used my Spellbinders Radiant Rectangle die to create this in the same manner I created the one for the Halloween post earlier. The pages have Collal Silicone glue between them to keep them raised. The great thing about the poinsettia is I can make it ANY size I want using my Silhouette Cameo. This whole card is no larger than 6.25 x 4.25 and has an easel stand I made with my own design on my Silhouette. After making one in blue I just knew I would want one in red as well. On this particular one I used my fave Krylon Gold Leaf pen around the edges of the outside of the red back. Every time I look at these I make myself crazy - I think, "Oh I love the blue" - then I think, "Oh I love the red" - then I think "No I love the blue". I swear each one is my favorite. These to had to have boxes made to transport them in....still decorating those. I have some more ready to assemble as I post this - think this will be a special Christmas card for some people close to me. Not saying who, you know if you've been naughty or nice - just saying!! A few weeks ago a friend and member of our small group Bible study contacted me about helping her daughter with her wedding invitations. 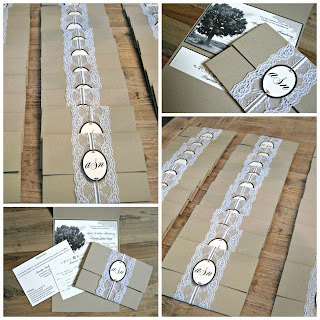 Her daughter had an idea in mind using lace as a belly band and wanted to incorporate a vintage style post card with a special picture on it for the reply card. She wanted to know if I thought her ideas were do-able as well as asking me if I thought her daughter could do it herself. She went on to ask if I would consider helping. Well I love a good challenge and I have never done wedding invitations. At the initial meeting with this young couple I knew I would do whatever I could to help them. 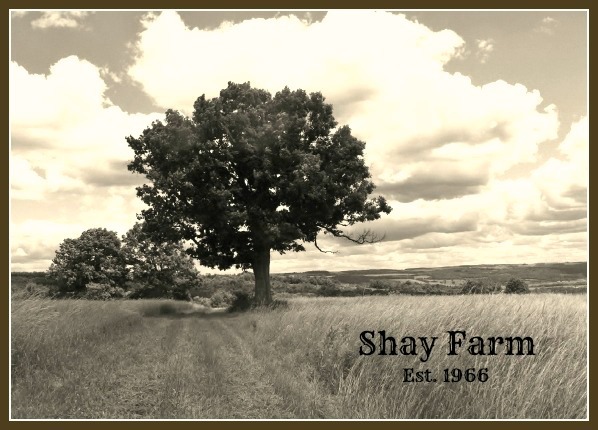 He proposed to her under a tree on a property near where he grew up in the Northeast. They very adamantly wanted to use a picture of the tree on the response card, and create a vintage look. I had recently acquired PicMonkey for photo editing (a great program) and decided to incorporate the use of my Silhouette Cameo as well. I created the post card.....and it looked pretty decent......but .....as I pinned I realized that the tree would probably look just as good on the invite. The bride to be had informed me she wasn't the fru-fru type gal and the postcard had such a dominating look. Soooo, I put together a prototype invite using the tree in the background. Yep, it was a success. We still used the tree on the front of the response card, but we put it in the invite face down so people could see both the information card and response card when the invitation was opened. Today we assembled the invites with the lace belly band and some twine (all part of the original idea) - we did decide during the planning process that there needed to be a little more on the front and decided on a monogram - once again done using my Silhouette (I'm telling you I LOVE this machine). This whole project has been great fun and I have learned tons about using PicMonkey and my Silhouette. I'm happy, the brides happy, the mother of the bride is happy, life is good. 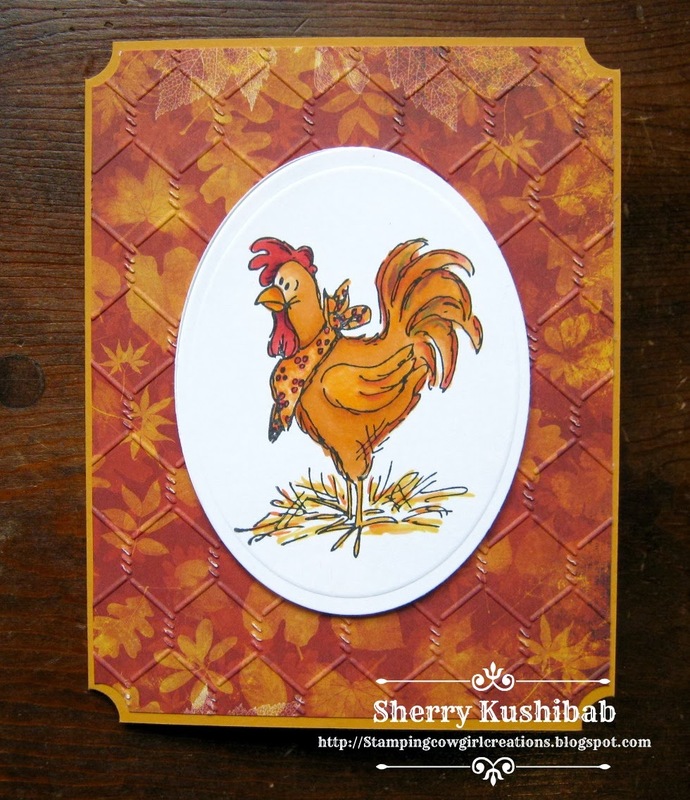 This little card is in answer to a challenge by a friend over at Splitcoaststampers. She decided it was time for a little Jammer Town fun........Jammer Town for those not familiar with the term is when we crazy stampers spend the day in (gasp) our jammies craft all day and make up stories about our cards (you can click on the link and see some of our saneness). Its my Birthday this weekend so I rightly feel I should be able to do what ever I wish and stamping is high on that list. Blooms aka Pat posted a menu from The Redneck Gourmet located here in the great State of Georgia. Several of us have let that menu inspire us to make cards and create some yarns about it. Mostly I joined in on this because she "Double Dawg Dared" us to ---- now I don't know about you but when I get a "Double Dawg Dare" I joins in. I recently purchased these cute little stamps at the Scrapbook Convention from the Rubbernecker booth. Then as a Birthday present to myself I went to my favorite little stamp store in Roswell and got some new supplies. 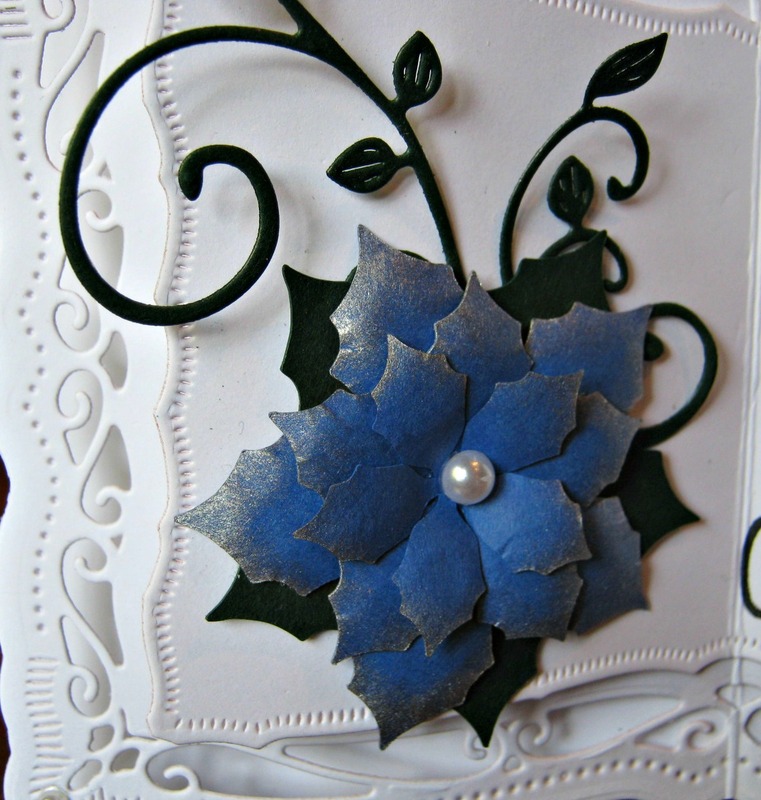 This card is cut using a die from Ann's Paper Art. 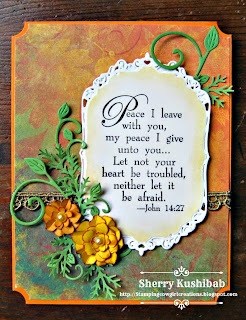 It is really for use as a stitching stencil, but it comes with about 5 other dies that are great for cards - the card shape and the sentiment shape were both cut using dies from this set. I also indulged myself with a little Graphics 45 paper, wanting a ribbon to go with the paper, and having the right color but wrong size I decided to create my own little paper bow. A first and I kinda like it.